Toronto Raptors guard DeMar DeRozan earned a spot on this season's All-NBA second team. 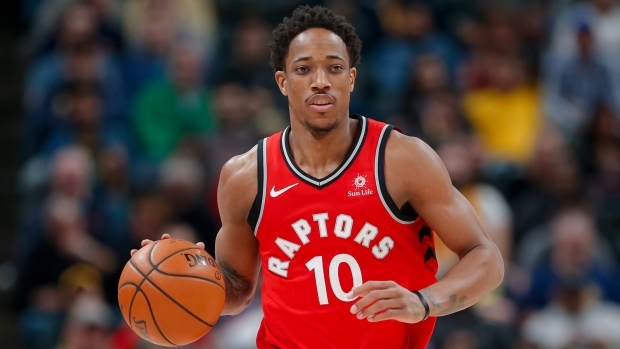 The 28-year-old set a career high in assists average while leading the Raptors to a franchise-record 59 wins and the No. 1 seed in the Eastern Conference for the first time. DeRozan averaged 23 points, 5.2 assists, and 3.9 rebounds per game, and made his fourth appearance in the NBA all-star game. Cleveland Cavaliers forward LeBron James was a unanimous All-NBA first team selection, giving him an NBA-record 12 First Team honours in his 15-year career. James has passed Kobe Bryant and Karl Malone, who both finished with 11 First Team selections. Houston Rockets guard James Harden also received All-NBA First Team votes on all 100 ballots, joining James as a unanimous selection. Harden, who led the NBA in scoring average (30.4 points a game) and three-pointers made (265) for the league-best Rockets, was unanimously voted to the first team for the second consecutive season. Joining them on the first team were Anthony Davis of the New Orleans Pelicans, Portland Trail Blazers guard Damian Lillard, and Golden State Warriors forward Kevin Durant. Joining DeRozan on the second team were forward LaMarcus Aldridge of the San Antonio Spurs, Milwaukee Bucks forward Giannis Antetokounmpo, Philadelphia 76ers centre Joel Embiid and Oklahoma City Thunder guard Russell Westbrook. Players named to the All-NBA third team were Minnesota's Jimmy Butler and Karl-Anthony Towns, Warriors guard Stephen Curry, Thunder forward Paul George and Indiana Pacers guard Victor Oladipo. The All-NBA teams were selected by a global panel of sportswriters and broadcasters.